Best BCAA by BPI brings forward a great-tasting 10 gram serving blast of amino acids, CLA, and agmatine sulfate. As you can tell, this isn’t your standard BCAA product. Actually, not even the BCAAs are in a standard form. Instead, this is a BCAA that contains Leucine, Isoleucine, and Valine all in oligosaccharide chains. This is something that we have not seen before. Here, we are going to review BPI Best BCAA based on our experience, fan user experience, as well as the science behind this BCAA. When you finish, check out our review of BPI’s pre workout 1MR Vortex! Taking BPI’s BCAA was a pleasure. It tastes great, mixes well, and is on point for both the intra workout window, post workout window, as well as throughout the day. In particular, this BCAA is ideal for men and women working to cut down fat, lean up, and transform their body. Guys trying to build up mass can take this BCAA, but it’s not entirely designed for major mass gainers. Compared to other BCAA Supplements, BPI’s BCAA is clearly focused on mix-ability, taste, and additional body sculpting fat metabolism. Hence the oligopeptide delivery mechanism that is highly water soluble, the whole gram of CLA per serving which is been found to reduce belly fat, as well as Agmatine Sulfate which improves cellular uptake of nutrients as well as promotes the nitric oxide pathway. This BCAA can be taken by bodybuilders and certainly won’t cause any negatives; but it’s really not specialized for bodybuilders. Instead, the characteristics we pointed out above are more relevant. 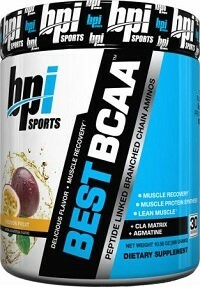 In BPI Best BCAA there are branch chain amino acids in the oligopeptide form. This means, each BCAA is in a chain of amino acids (oligopeptide) which makes the specific branch chain amino acid more easily absorbed into the body. So, in essence more of the BCAAs in this supplement should be bioavailable for you upon taking, compared to the competition. However, there is a caveat to using oligopeptide branch chain amino acids. 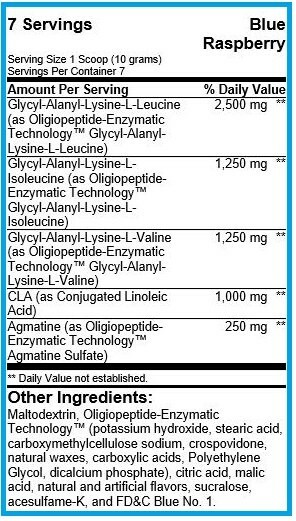 And that is, the entire oligopeptide chain is included in the BCAA weight specified on the label. So, where the label insinuates 5 grams of BCAAs, the reality is that its 5 grams of oligopeptides and the real BCAA weight is closer to 2 grams per serving. For the type of person we discussed above, this isn’t a bad thing. After all, there is enhanced bioavailability. But, for a bodybuilder who is trying to stack as many pounds of muscle as possible – better, more specialized options are available for building that mass. Conjugated linoleic acid is an unsaturated fatty acid similar to fish oil that is believed to help metabolize stubborn fat on the body. Supplementing with CLA is not intended to have drastic results. Rather, it’s a fine-tuning aid that will be more noticeable in some versus others. Agmatine is one of those compounds that seems to do a lot of good stuff in the body. To get the full scoop on Agmatine, you can check out this overview on Examine.com. But, the grand takeaway for gym junkies like us is as follows. Agmatine is a metabolite from arginine which can benefit both the nitric oxide pathway as well as cellular nutrient uptake; both independently. As a whole, BPI’s Best BCAA is a new take on branch chain amino acid supplements. They went in deep with the oligopeptides for transport vectors, but not quite hard enough for serious bodybuilders. If you are a cardio junkie who needs a BCAA – this is a great choice. Its easy to mix, easy to drink, and will get where it needs to go. We recommend this BCAA highly to the category of people we specified above and believe it will be thoroughly enjoyed!